Have you heard about kickstarter.com? It’s a website that facilitates funding, patronage, and investment in creative projects. A project’s creator sets the level of funding that is needed and a date that the funding is needed by. If the funding isn’t met by a particular date, then the project does not get funded. 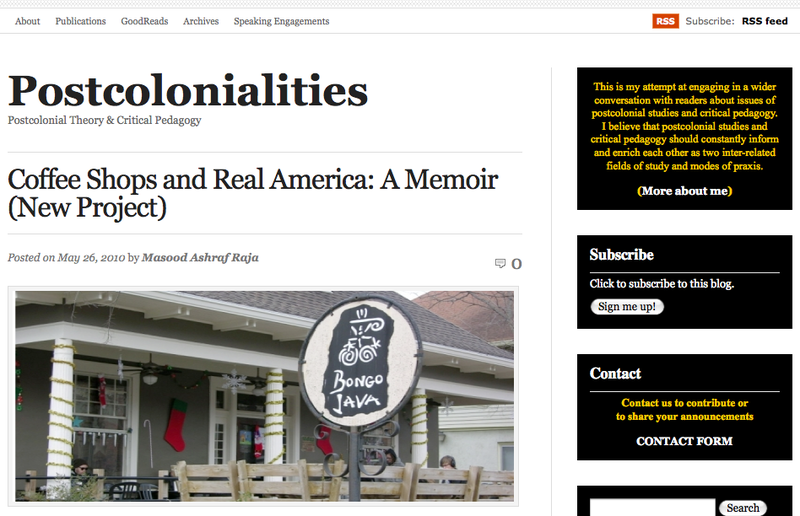 I have some ideas that I have been kicking around that would be kickstarter worthy, but in the meantime, check out Masood Raja’s latest book project titled Coffee Shops and Real America [book info here and kickstarter page here] and consider helping him on his way to making the book a reality. He’s already received pledges from three people, but he could use your support, too. You have until July 11 at 8:00pm to get some thanks and bonuses for helping the memoir happen. Thank you for posting this. We should have a get together after your exams. Sounds great. Two weeks, and then I will be on the other side!